A truly strange variant of the fable, probably the oddest in this entire collection. 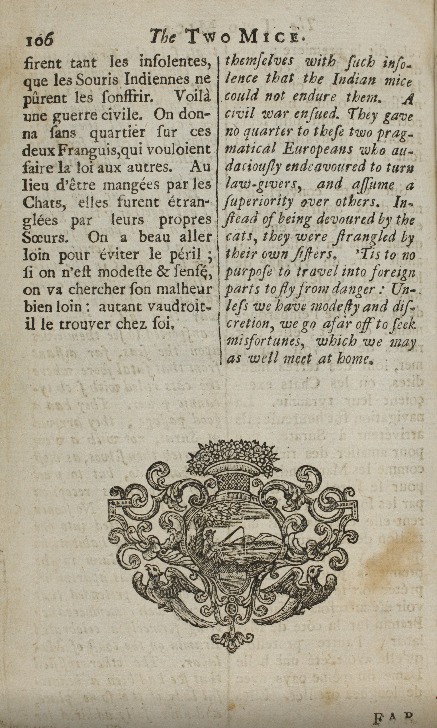 This version comes from an 18th century fable book in Creighton's Carlson Fable Collection. The book this version is drawn from seems to be intended for the education of the very young, but this fable is told in a manner more like a spoof or a send-up, as if its audience would be familiar with the basic structure of tale (or more likely, sick of hearing it so much). 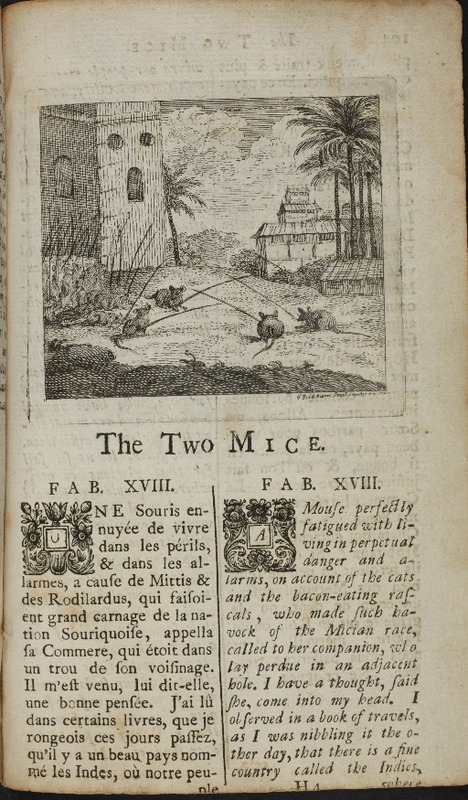 So in this version, both mice travel somewhere new: The Indies, which are initially portrayed as a fanciful paradise where mice can live out their days in peace (because, one Mouse observes, the doctrine of Metempsychosis or Reincarnation requires Indians to treat all mice with respect). 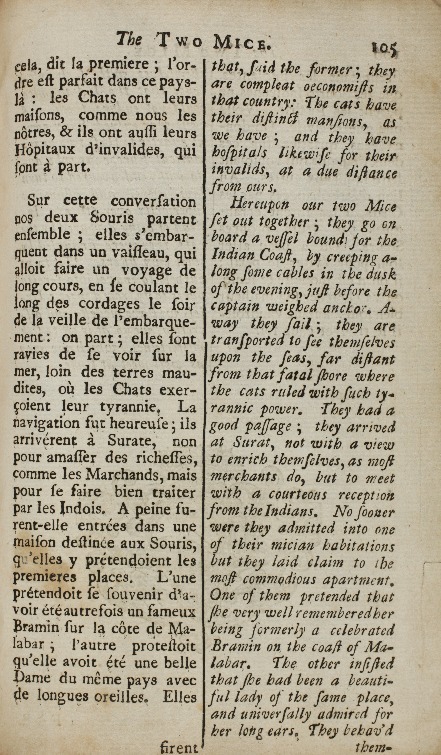 The mice board a boat for the Indies, arrive at Surat, pretend to be reincarnations of ancient noble ladies, assume dominion over the locals, and are killed shortly thereafter in a colonial uprising. In short, this version has structural similarities to the classic version of the fable, but takes it some very different places. 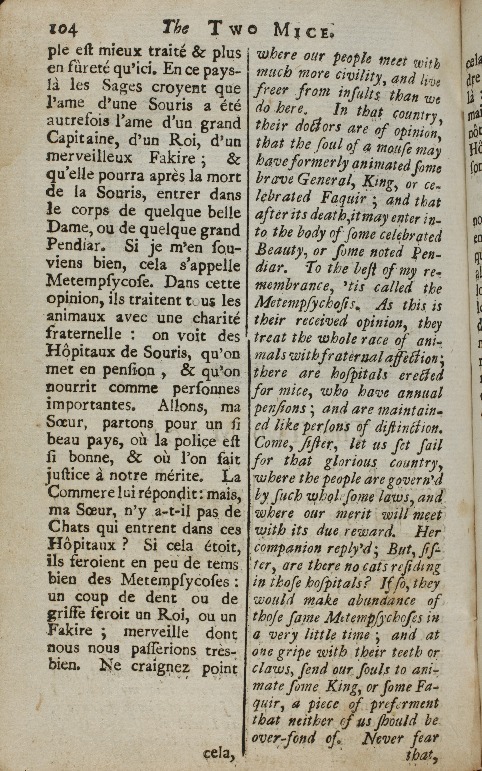 It's quite politically self-aware for an 18th century work. Reading this version, I can't help but shake the feeling that there's some context to this story I'm missing. Please write me if you understand what is going on here.